In this post I paired up with the lovely Charlotte from Beauty and Bolder. On her blog you'll find her recreating lot's of amazing looks, as well as reviews and lifestyle posts. She's very talented and her step by step tutorials are so easy to follow! As you'll see in this post she recreated each of the trends for you and she's definitely tempted me into trying the metallic eyes soon! 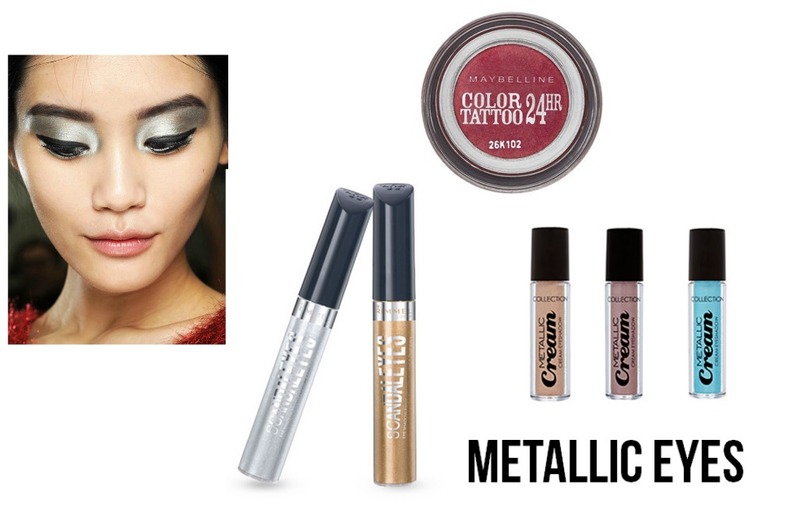 Forget mattes and shimmers, metallic eyes are making a comeback this season. The look is relatively simple to recreate, all you need is a wash of metallic eyeshadow over the entire lid. If you’re feeling more adventurous you could try a similar metallic shade in the crease. This look isn’t limited to makeup artists with their expensive kit. Affordable options include the Rimmel scandaleyes eyeshadow paints, Maybelline Colour Tattoos or the Collection metallic cream eyeshadows! The bigger the better! 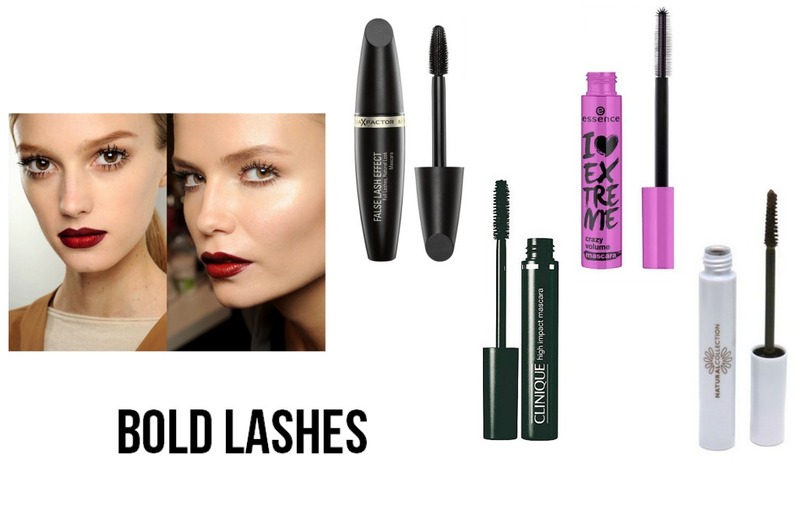 Bold lashes look great with a minimal look! My favourite picks for bold lashes are the Max Factor false lash mascara, Clinique high impact, any essence mascara and the Natural Collection lash length mascara for only £2! Pair bold lashes with a statement lip like Charlotte and you're good to go! As soon as the first bit of cold hits us makeup fanatics across the country rush not for their jumpers, but scour the high street for the perfect vampy shade! 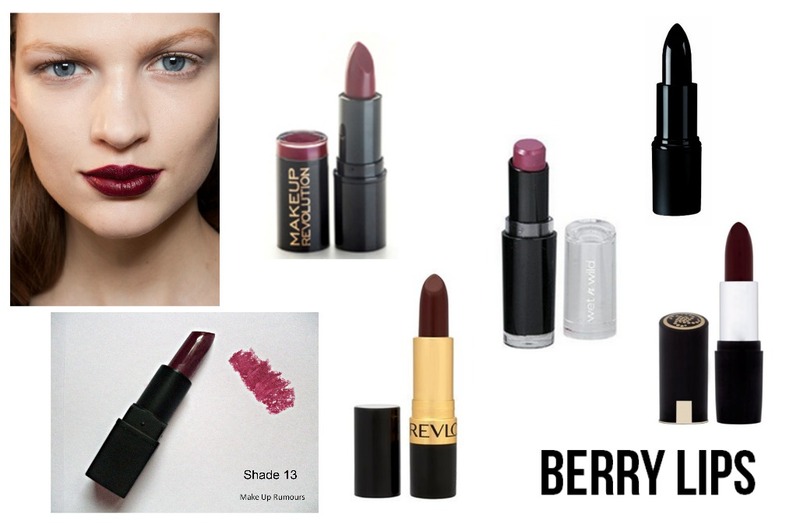 There’s just something about purple, dark red and mulberry lipsticks that has us eagerly anticipating winter. My top picks are the Make Up Rumours lipstick in shade 13 (for only £1), Revlon Black Cherry, Makeup Revolution Rebel without Cause (also only £1), Wet N wild Sugar Plum Fairy, Sleek Mulberry and Collection Gothic Glam in 3. Berry lips look great with an otherwise no makeup makeup up, adding eyeliner close to the lashline and a coat of mascara will also add some definition whilst still keeping the whole look quite simple. I hope you enjoyed this post, I certainly loved this collaboration! I'd love to hear what new trends you might be trying yourself this season! Metallic eyes are perfect for the Christmas Party season - gives you an excuse to keep everything else nice and simple! I also love the deep berry lip trend, you've styled it beautifully here! ill definitely try the metallic eye look this A/W. thanks for the post. love berry lips! I love the berry lips look!